Join our Movie Fan Club & Win! 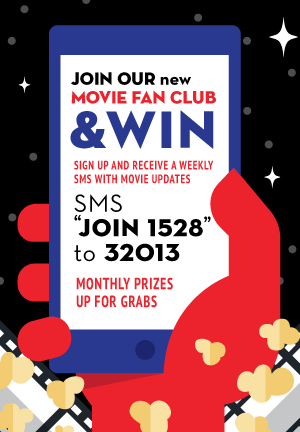 SMS “Join 1528″ to 32013 to receive a weekly sms with movie updates! 2 tickets could be yours! Joining SMS costs R1.00 (once off). Free and bundled SMSs do not apply. Notification SMSs from Minimax are FREE of charge. Enjoy a delicious dinner at Salt Restaurant, followed by a big screen movie! Every Wednesday, for only R100 per person. It’s a REEL DEAL! All movies half price on Monday & Tuesday! Save R10 on your Minimax Movie ticket when you present your valid Drakenstein Library Card!